We view health and healing as functions of a person's aliveness within all four domains of being as shown. Weakness, lack of presence or diminished responsibility in any of these dimensions can lead to illness or disease. 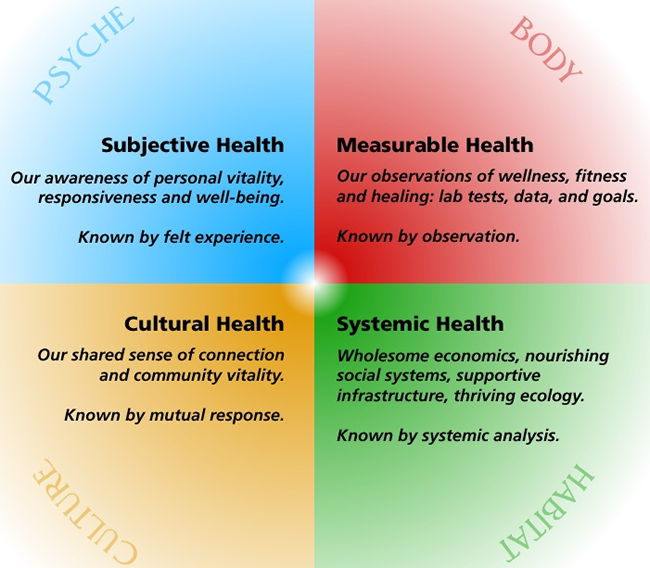 In diagnosing and treating patients we consider the whole person's health in all four domains. "When you buy a pill and buy peace with it, you get conditioned to cheap solutions instead of deep ones"
360 Medicine. Improving all aspects of your health: physically, energetically, mentally, spiritually. We provide the highest quality integrative healthcare available, facilitating the healing and personal growth of our patients, their families, the community and our shared planet. We cultivate an organic-integral approach to remedy health disharmony. Utilizing treatments that get to the root of what's occurring biologically, we look at hormones, neurotransmitters, GI function, nutrient repletion, oxidation, immune function and detoxification. Furthermore, we view these particular details from within an overarching integral view, honoring medical-biological data, subjective experience and internal feelings, social dimensions, life stages, environmental effects and levels of spiritual growth. When gathered up into a coherent whole, this view allows for a more effective healthcare plan, both for short term intervention and longterm deep vitality. Sustainable/Green Medicine is another aspect of what we strive for. Our rivers are full of pharmaceuticals as well as other chemical pollutants. We practice responsible medicine that doesn't continue to fracture the earth's systemic harmony. Sustainable medicine isn't just about the biosphere, but it's also fiscally sustainable at a time when it costs an employer an average of $10K/year to fund just one employee with the average HMO plan, and healthcare expenditures threaten the viability of our nation within the larger global economy. 360 Medicine: Individual Well-Being, Family and Community Health, Global Harmony.